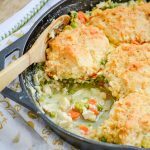 A creamy chicken & veggie cobbler, this one's topped with a cheesy biscuit crust for the ultimate comfort food mash up, all in one skillet. To a large cast iron skillet, add the oil & onions. Stir, cooking over medium high heat, just until the onions begin to turn translucent. Stir in the mushrooms and carrots, reducing the heat to medium, cooking and stirring again until the become tender. Stir in the sage, thyme, and butter. When the butter's melted, stir in the flour until it's adhered to everything and no clumps remain. Let it cook, stirring, for one minute more. Add the broth & milk, a little at a time and stirring constantly, until completely incorporated. Salt & pepper the mixture to taste. Continue cooking until the filling is bubbling and thickened. Fold in the chicken and peas. Remove the skillet from heat. To a large mixing bowl, add the flour, sugar, baking powder, garlic powder, salt and cayenne pepper, if using. In a separate, smaller bowl- whisk together the buttermilk and the half cup of melted butter. Pour the milk and butter mixture over the dry ingredients in the larger bowl and stir, using a rubber spatula, just until moist. Using the same spatula gently fold in the cheese. Using a large spoon, drop biscuit sized dollops (about 1/4 cup) of dough onto the top of the cobbler. Remember they will plump up and spread some when baked. Bake the cobbler at 400 degrees for 20 minutes, or until the biscuits are golden brown and a toothpick inserted in the center comes out clean. In a small pot, melt (and stir together) the butter, parsley, and garlic. Brush the mixture out over the tops of the biscuits. Let rest 1-2 minutes, and serve.